University of Auckland and Uenuku Fairhall (Te Arawa: Ngāti Rangiwewehi, Waitaha, and Ngāti Te Rangi: Ngāti Hē ), Principal of Kura Kaupapa Māori o te Koutu. Analysis of the Māori medium numeracy project (Te Poutama Tau) student data found that language proficiency was a significant factor in student achievement in the higher stages of the number framework (Christensen, 2003). In kura kaupapa Māori , students often have te reo Māori as a second language. Consequently, there is a need to understand more about how to support students learning athematical content at the same time that they are learning te reo Māori and, in particular, the mathematics register, te reo tataitai. This situation is complicated by the newness of this register in te reo Māori (see Christensen, 2003; Meaney, Fairhall, & Trinick, 2006). The effect of language on mathematics learning has been recognised for sometime (Ellerton & Clarkson, 1996), but little research has been carried out on how students acquire the mathematics register. During 2005 and 2006, this Teaching and Learning Research Initiative (TLRI) project gathered information on the acquisition of the mathematics register by documenting and evaluating the scaffolding and modelling of student’s mathematical language by the teachers in a kura kaupapa Māori . It involved a partnership between seven teachers of mathematics at Te Kura Kaupapa Māori o te Koutu and three researchers. The teachers were also participating in Te Poutama Tau and felt that this research would complement that project. Having all the teachers involved in this project meant that the results are seen as coherent and of use in discussions about the mathematics programme. The final stage of the research investigated how this knowledge affected the teaching practice of those involved and this enabled an appropriate evaluation of the research for its practical value to be undertaken. 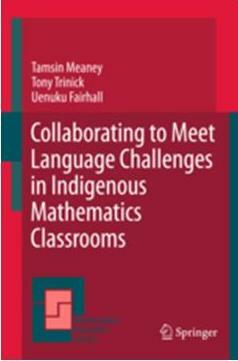 Better understanding of how the mathematics register is acquired is likely to be of benefit not just to kura kaupapa Māori teachers and their students, but also to others considering language issues in other content areas. Tamsin Meaney is now Professor of Mathematics Education, Faculty of Education and Society, Malmö University, Sweden.